Chevrolet just announced they’re stopping production of the Chevy Volt for five weeks because no one is buying the stupid things, and they have too much inventory. The car maker blamed the media for exaggerating those pesky fires that occurred in the battery packs after side crash tests, but the real problem is the cars are too expensive and the technology doesn’t make any sense. The Chevy Volt costs $41,000 and you can supposedly travel 35 miles on battery power alone. After that a gasoline engine comes on and provides power to the electric motors that propel the car. Unfortunately, there are a number of problems with this set-up. For one, the majority of our electricity is provided by coal-fired electric plants so you aren’t cutting down on greenhouse gases by running this thing on battery power. You hippies are basically driving a car that’s coal powered. You know, like that other green technology, the nineteenth-century locomotive. You could buy a new Honda Accord with a 2.4L V4 for $24,000, and you’d get 34 mpg highway and 23 in the city. If you average that mileage to 28.5 mpg, even if gas hits $4.00 a gallon you can drive over 120,000 miles for the $17,000 price difference between it and the Volt. And with the Volt, you still have to pay for the electricity to charge it and the gas to run the motors after the batteries are exhausted. 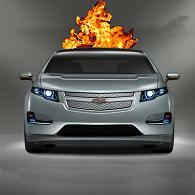 Chevy also forgot to mention that if it’s cold out, the gasoline engine has to engage to warm the batteries. It also comes on during hard acceleration, even though the car is supposed to be 100% battery powered during the first 35 miles. Those are just minor issues; the real problem with this car is the faulty premise upon which it’s built. We’d be better off powering our cars with natural gas. It’s cheap, clean, costs about a third of gasoline and we have a ton of it. The only problem is service stations aren’t set up to provide the fuel, so car makers keep working on these stupid electric cars because they feel everyone has a power outlet. Instead of sinking tons of money into yet another dead-end technology, the government should work on a building a natural gas fueling infrastructure. Then again that actually makes sense, so there’s no chance of us doing it.